Are these European leaders inferior beings? They have denied that terror will happen as a result of immigration in spite of clear signs of warning. Now that it is happening, they deny that it can be stopped. Are they the most inferior human beings imaginable, the most intellectually challenged, inert and lazy, the most passive and uncreative people in existence? Re: Are these European leaders inferior beings? Conservatives showed increased activity in brain regions previously implicated in processing disgust, such as the basal ganglia and amygdala, but also in a wide range of regions involved in regulating emotion, attention and integrating information. In liberals the brain showed increased activity in different regions, but these were just as diverse. The problem with leftists is their worldview. They believe people are good at heart. That creates a host of misconceptions about the world that lead to the irrationality we see today. Is there a genetic or some other physiological cause for that? I don't know. I think it's tied in large part to personality and upbringing, but insofar as the former is genetic, it's possible. I actually score very high on openness on Big Five, which is a liberal trait, and I'm a democratic socialist, which may be normal in Europe but is considered wildly liberal in America. That being said, I was always a picky eater, I have very clear preference, and even when I watch horror movies, what bothers me the most are gross or disgusting movies. I have read the theory before about conservative/liberal worldwide and I do think it has some basis in reality, because I'd likely be more moderate or slightly right wing in Europe because of my natural suspicion and knowledge of the bad motives of people. My canny nastiness has probably saved my life and dignity in the past, and my mom says I inherited it from my conservative grandfather. I think people who welcome all Muslim refugees border on the insane, and I am a strong believer in boundaries and saying no, though in the US I actually do not fit with Trump supporters at all. I really like the American Conservative because I think it's one of the most rational political publications in the US, but I honestly see few active conservative politicians who embody such high minded educated moderate conservativism in my country, I mostly see corporate capitalism and sowing of ignorance, which I despise. I knew Trump could not make America Great Again because my conservative grandfather was careful, earthy, self reliant, and loved books...he was also quiet and thoughtful and only spoke with humor or force, rarely without necessity. He valued education and the earth highly and I think he was probably more like John Muir the naturalist, than a spoiled arrogant billionaire like Trump. I think American conservatism is in the gutter. @Smitty wrote: The problem with leftists is their worldview. They believe people are good at heart. That creates a host of misconceptions about the world that lead to the irrationality we see today. Is there a genetic or some other physiological cause for that? I don't know. I think it's tied in large part to personality and upbringing, but insofar as the former is genetic, it's possible. People who are explicitly social liberals (rather than economic, which I am) are extremely naive. They make up the majority of Islamic sympathizers and people who hold blacks to a lower standard than whites, which I find ironically racist and appalling. I was not on board with Hillary Clinton for this reason. I find liberal identity politics extremely irritating. I believe in personal responsibility, real equality, education and protecting that which is right or true. I balk at the post modern liberal idea that truth is unknowable. I'm not a big fan of political labels in general since they often paint over important nuances. I don't see how a thinking person can completely subscribe to one political school or other. With politics, the devil is in the detail. @Aëlwenn wrote: Im leftist so ...? Seeing news like the one I post below I think they're attached to simplistic and biased stereotypes, like 'european = predator, imperialistic, genocidal, opressor, exploitative,racist.... etc', and basically the rest of the world are good and innocent people, noble savages or philanthropic civilizations. It's also shocking how they apply cultural relativism to judge the apparently barbaric, unfair of some customs/traditions or way of living of non european peoples, and at the same time the judge very ancient milestones or simple facts of european history applying the most rigid morals of modern political correctness. Podemos (a radical leftist and succesful political party) requires Spain to ask for forgiveness to Islam for the taking of Granada. 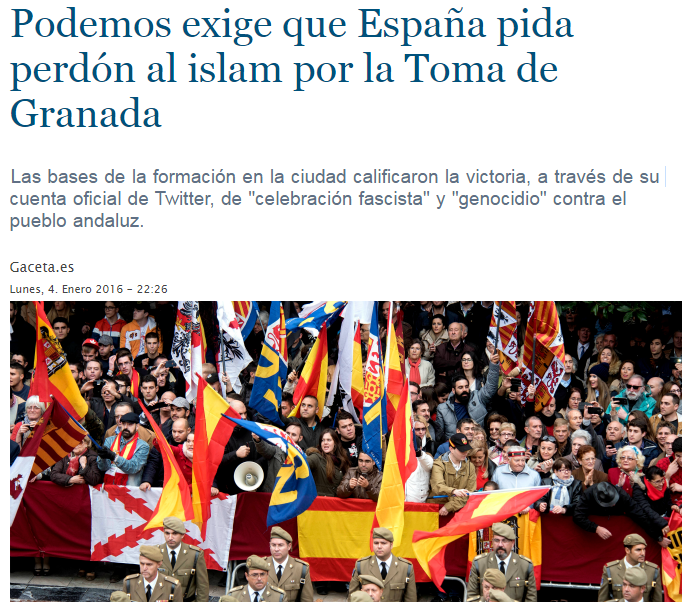 The popular base of the party in the city described the victory, through their official twiter account, as 'a fascist celebration', and 'a genocide against andalusian people'. I see they are a pretty big party with 21% of the national vote. The sad thing is, I could agree with many of their policies but then they spoil it with their anti-nationalism. I do not see why a party cannot be socialist (to a degree) and environmentalist and also support their national identity. I think that all goes well together. Yeah, one stereotype about nationalism is that it is aggressive. I suppose we can partly blame Hitler and co. for that. But you would expect intelligent people to understand that nationalism can be a reasonable and peaceful position. "Leftists have denied that terror will happen as a result of immigration in spite of clear signs of warning. Now that it is happening, they deny that it can be stopped." If you have denied that immigration comes with great dangers then you are an indisputable leftist. So much for that distinction, which is not meant to be the main point of discussion. If someone also denies that terrors can be stopped (more or less efficiently) then he disqualifies his own thinking and displays a lack of inventiveness when it comes to solving problems which are already there. It is the particular lack of character so clearly put on display in the joint positions 1 and 2 of the quote which I wanted to have a discussion about. Those are always the same people who also turn to the worship of "our model of society" when something really bad happens as a direct consequence of what is better described as their society, because they created it, and they CREATED the problems too in the process, whether they are ready to assume responsibility for them or not. @Gaut wrote: "Leftists have denied that terror will happen as a result of immigration in spite of clear signs of warning. Now that it is happening, they deny that it can be stopped." Regarding immigration and EU there're differences between the elite and the 'general' public, including among 'general public' quite leftists, I hope. At least that is what says this survey of The Royal Institution of International Affairs. Merkel for example is not a leftist at all, but she's the main responsible of the refugees crisis Europe is facing these last years. Also many europeans goverments which are no leftists are doing nothing to stop the massive invasion of illegal immigrants who leave Lybia in boats and call european NGO to go to 'rescue' them and bring them to Europe like a taxi service. Based on a major survey across 10 EU countries, a new report shows a lack of consensus among the elite over the future of EU integration - and a pronounced divide within the public on issues of identity. The data reveal a continent split along three lines. First, there is a divide between elites and the public. There is alignment between the two groups in their attitudes to, among other things, EU solidarity, EU democracy and a sense of European identity. However, the data also show an important divide in general attitudes, beliefs and life experiences. The elite are more likely to experience the benefits of EU integration and are more liberal and optimistic. Meanwhile, there is simmering discontent within the public, large sections of whom view the EU in negative terms, want to see it return some powers to member states, and feel anxious over the effects of immigration. Even Theresa May is a leftist after my standards of evaluation where right wing means a traditional, protective, personal family oriented and (by extention to a macro-level) nationalistic approach. Left wing means a "rationalist" and "progressive" spirit opposed to traditional order. For better clarity I should have talked about the leaders of Western Europe and Germany among other countries. But I think that anyone who has followed recent events has also noticed the contradictions in which the leaders of said countries have willingly entangled themselves.